New listing ! More info and Pictures Coming Soon ! White Hull ! She was so nice she was features at The Fort Lauderdale Boat Show at the Intrepid Display. 43 SY Intrepid Powered By Triple 350's Yamaha 160 hours ,Diesel Generator 360 hours with Separate Diesel Tank,. Loaded with Electronics !!! Full Garmin Package : 2 17" Screens, Autopilot, FLIR, Radar, Underwater lights, 12 JL Audio Speakers, 2 JL Audio Subwoofers, 3 JL Audio Amps, Fusion Stereo, Icom VHF and many more !!! 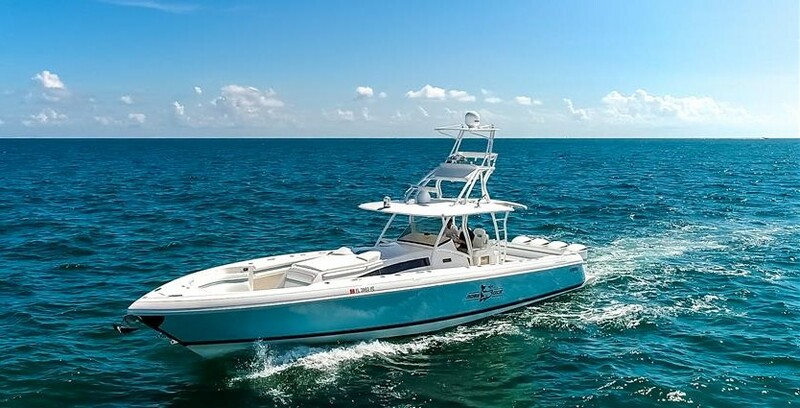 Boat Optionals: Fold Out Dive Door, Diesel Gen, Cockpit AC, Outriggers, Wood Floors in Cabin, Flex Teak in Cockpit, Full Eisenglass Enclosure, and many more !!! Looks like new, smells like new !! !